The MGB GT has always punched way above its weight, at least in the looks department. The classic long hood/short deck design combined with a practical hatchback is a potent combination that hits both the right and left sides of your brain simultaneously (much like the Volvo P1800ES) and you find yourself silently mouthing “I love you” at a total stranger’s car. But in 1974 there were a few changes. If the post ’74 GTs were a person, they would be your uncle Terry. You remember Terry. He’s a suave world traveler, he’s still handsome, but after that mountaineering accident on the side of Mount Everest he’s got a permanently black frostbitten nose. Hard to not stare. Add a bit of a paunch, and his pants pulled up a little too high, and you’ve pretty much got the story of the post 1974 MGB GT. As a result of tougher crash standards, automakers in the ’70s were scrambling to pass the 5 mph bumper test. One look at the great Lamborghini Countach after huge chunks of rubber were bolted right to its formerly beautiful front end revealed that even the Italians were struggling with how to deal with it. Give credit to MG for attempting to creatively bake the crash standards right into the car’s design; our modern cars are made this way, but with the plastics much more elegantly concealed. This is not a fast car. The MGB GT’s “rubber” bumpers (not rubber, actually: polyurethane and steel) added significant weight, plus, the ride height was raised, and power was dropped to a wheezing 62 bhp. Still, this MGB GT wearing a very British shade of green commanded loads of attention on a quiet road in northeast London, and all of these things are reversible in the aftermarket if you want to cruise like it’s 1971. Bolt on a supercharger and you can double the horsepower. But why mess with it? 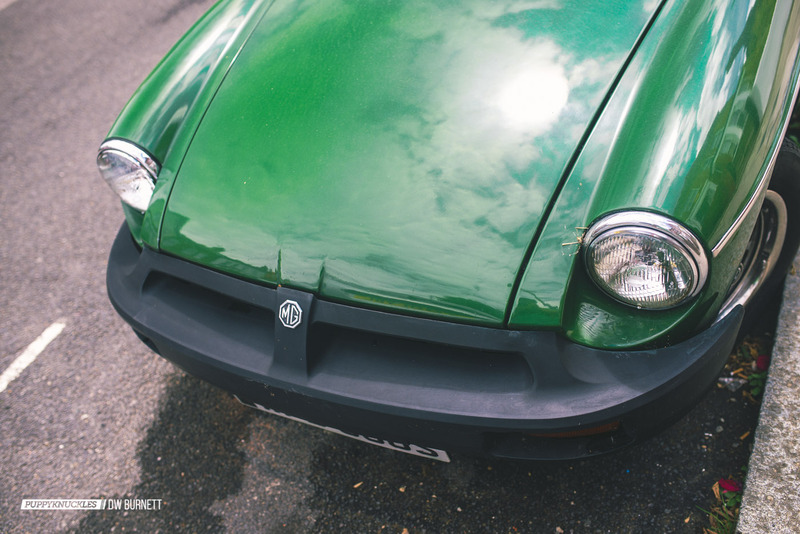 The rubber bumper MGB GTs are a super practical choice for a daily driver; not as precious as an earlier car, and if you live in a city, you have bumpers you can actually use.